Parents, does your child need help to excel in Math? Does any of these sound 'all too familiar' to you? My child is too addicted to the iPad and other electronic gadgets. "I need to bribe my son with iPad.. otherwise he won't be motivated to do his Math homework!" "My daughter is always on the computer. I have to keep nagging and nagging at her before she turns it off. I really wish I didn't have to nag." My child gets bored easily and has trouble focussing when trying to study. "My daughter can't seem to focus for long periods of time. After 10 minutes of homework, she gets tired..."
"My son gets bored easily and lacks motivation​ to do any self study." My child's homework is getting more and more difficult. I want to help but I end up getting frustrated. "The MOE syllabus is getting more and more difficult! I never had to solve this kind of questions when I was his age!" 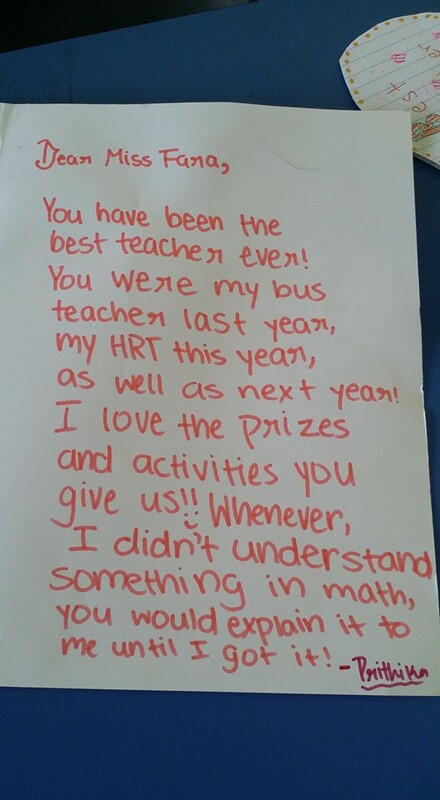 "My child doesn't understand what the teacher taught in school and struggles to finish her Math homework and score well for exams." My child has the potential to do well, but is underperforming. What can I do? Firstly, you need to stop blaming yourself or your child. Think positively: for every problem, there is always a solution. Secondly, talk to your child and understand his or her needs. Oftentimes, we parents blame the child for their shortcomings without actually listening and understanding why they are underperforming. Thirdly, do your research and make well-informed decisions. Not all tuition centres provide the best learning for your child. Just because a certain tuition centre is popular, it does not mean the particular tutor you are getting is the right tutor for your child. If you're reading this, it means you care about your child. Every parent wants the best for his or her child. As a parent, you want to find the best possible teacher for your child. Someone who not only has the right credentials to deliver results and provide the best education for your child, but someone who also cares about your child as much as you do and is able to inspire and ignite your child's love for learning. Here are the top 5 tips practised by TOP MATH STUDENTS proven to improve any student's grades and overall learning experience. The brain is not a muscle, but it works like a muscle. Even the smartest of people, used to say "goo goo ga ga" when they were a baby. It takes time and a lot of practice before the human brain learns and develops skills to form words which later become sentences. In other words, our brain is like a muscle which gets stronger the more we practise. Likewise, in Math, the more you practise the better you become. This means that anyone can be good at Math and excel at word problems. People with a growth mindset believe that they can achieve anything with effort and practice. People with a fixed mindset, however, gives up before even really trying. 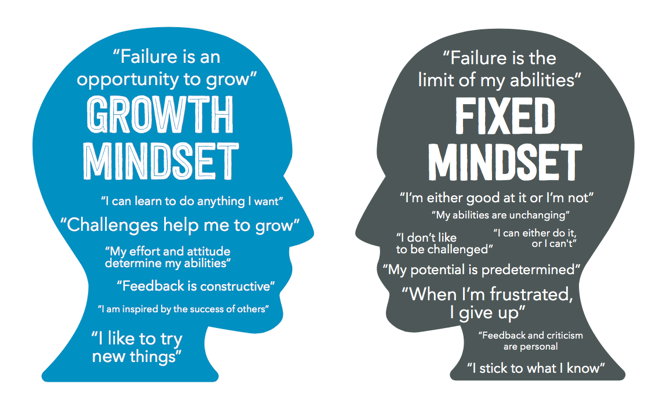 So it's best to ditch the fixed mindset and adopt a growth mindset. Like they say, "Practice makes PERFECT!" Many institutions believe that each person has a different learning style: Visual, Auditory or Kinaesthetic. Recent research studies, however, suggest that learning styles are a myth (here's a link to the TedX talk if you'd like to learn more). But what isn't a myth is the fact that all students benefit from better understanding and retention when they are exposed to multiple senses when learning. For example, Fractions can be learnt through cutting a pizza into parts and eating it. Students can also have hands-on investigation activities on Fractions followed by group discussions. 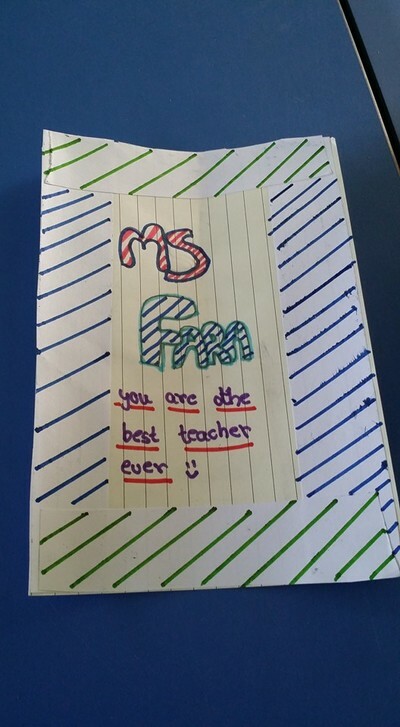 Multisensory learning enables them to make meaningful connections and interpretations, which aids in memory recollection and depth in understanding. We all know what Whole Numbers are, but did you know that there are many different types of Whole Number problem sums which require different strategies? The above cow and chicken question for example, can be solved using two heuristic techniques: Guess and Check, or Assumption Method. There are many other more challenging questions in your child's exam paper which require other heuristic techniques. The ever popular technique Model Drawing itself has many subcategories, depending on the type of question. Some include: Before-After Concept, Constant Total, Constant Difference and Working Backwards. So the trick to scoring well in Section C is, to master Heuristics, not just topics. It's okay to make mistakes and your child should not be afraid to make them... as long as he learns from them. Students who are too afraid to make mistakes often suffer from the Fixed Mindset (see tip #1) and this stunts their learning. However, that being said, many students make careless mistakes and calculation errors which does not add value to their learning and instead, causes them to lose unnecessary marks. There are many methods and tricks to reduce careless mistakes, which a good teacher or tutor will be able to coach your child to use. 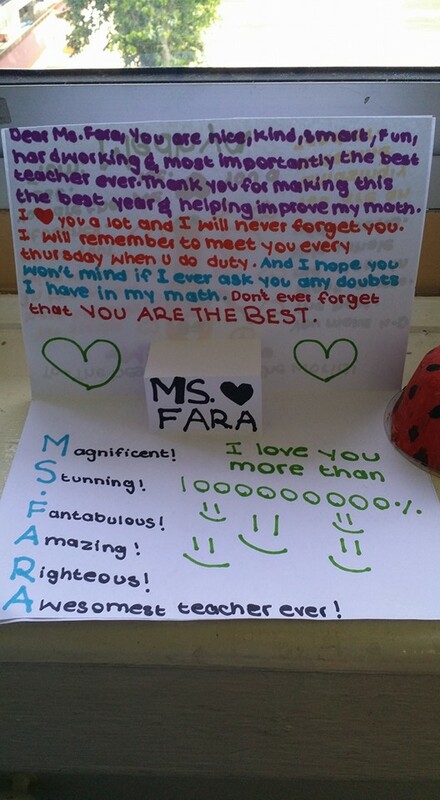 Ms Fara has a strong passion for Mathematics and has taught the subject since 2009. During her secondary school years (in SCGS), she has always scored particularly well in Mathematics and won distinctions for various Math Olympiads including the UNSW Math Competition. After getting her Bachelor's Degree from the Australian National University, Ms Fara joined the reputable olympiad training centre Maths Hub (now renamed to MSO Pte Ltd) where she trained primary students to prepare for international as well as local Math Olympiads, including AMC, AMC8, Gauss, UNSW, NMOS, RIPWMC and SMOPS/APMOPS. She was hired to conduct after-school Math supplementary classes in many primary schools such as Raffles Girls, Henry Park, Nanyang, MGS, Nan Hua, Keming, Pioneer and Nan Hua Primary Schools. 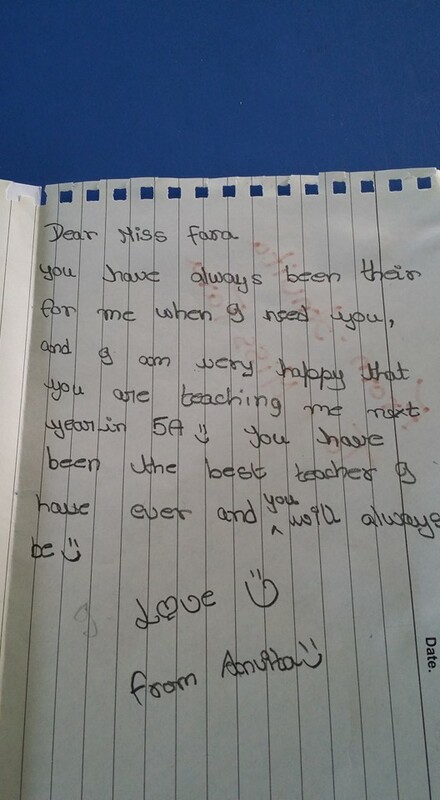 After teaching Math Olympiad and Heuristic skills for 5 years, Ms Fara joined NPS International School where she taught Grade 3, 4 and 5 Mathematics to international students. She introduced the concept of model drawing as one of the many heuristic skills to solve problem sums, contributed actively in curriculum content planning and even received a commendation award from the Primary School Principal for her effective teaching strategies. ​Ms Fara quickly gained popularity among the students due to her warm, encouraging nature and also became the school's Level Coordinator for Grade 5 and the overall in-charge for SMOPS, UNSW and SOF Olympiads. During her time in NPSI, she also conducted Math workshops for parents, specialising in teaching parents about heuristic skills and how identifying different heuristic techniques can help sharpen problem solving skills. 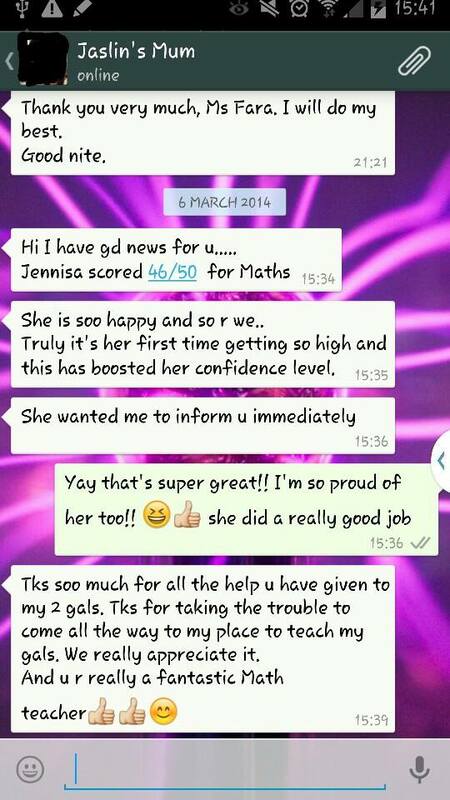 What do students say about the SG Math Tutor? 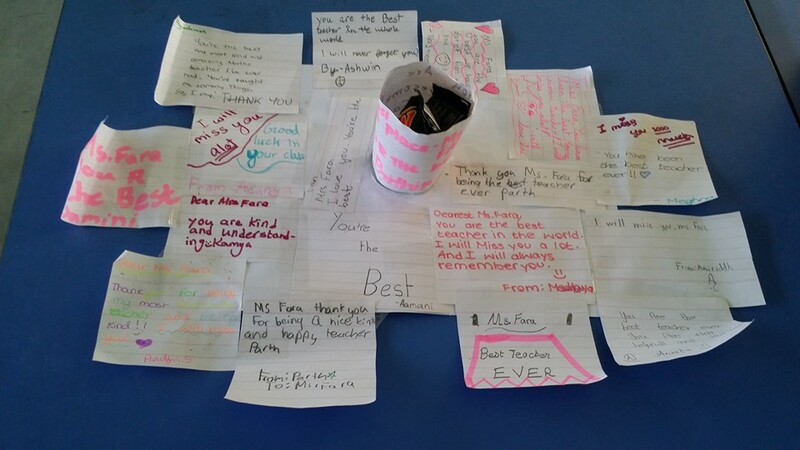 Here are just a few of the many messages students have written. Click on the individual images to zoom in. 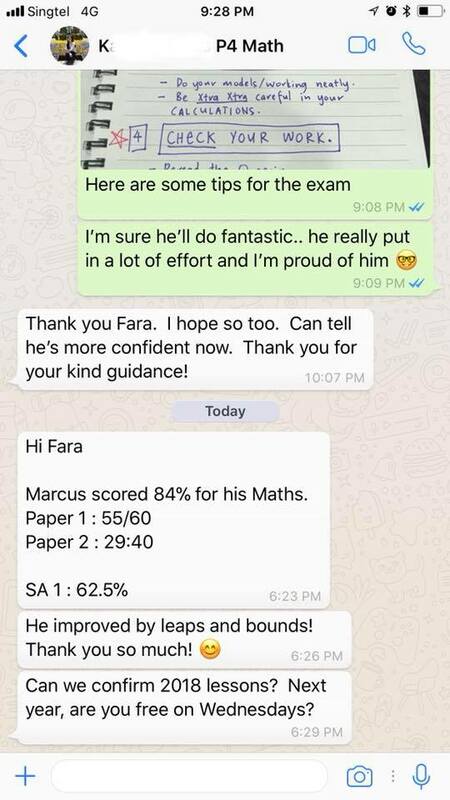 What do parents say about the Sg Math Tutor? 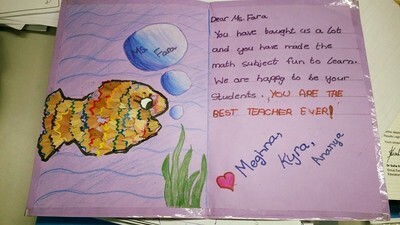 Ms Fara customises her lessons to cater to each child's needs. 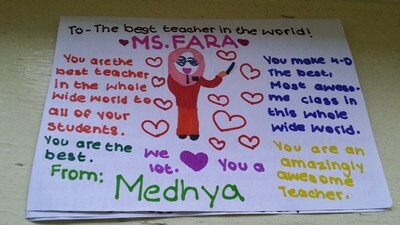 She is able to use a variety of teaching-learning methods (eg. flashcards, hands-on activities, games, oral quizzes, worksheets, past exam papers) in order to provide a multi-sensory approach which aids in better retention and understanding. Being a Math Olympiad trainer and a Problem Solving Heuristics specialist, Ms Fara also has many tricks up her sleeve on how to solve challenging word problems, especially for the 4 or 5-mark questions in Section C. Students enjoy her warm, friendly and patient nature, and 100% of her students show improvement in grades just within a minimum of a few months of coaching. Above is the current class schedule for 2017. Do whatsapp us / contact us at tel no. 96652893 if you prefer alternative timings, and we will try our best to accommodate. Please note that classes are very limited to 6 students per session and priority will be given on a first come first served basis. Private home tutoring is also available upon request. 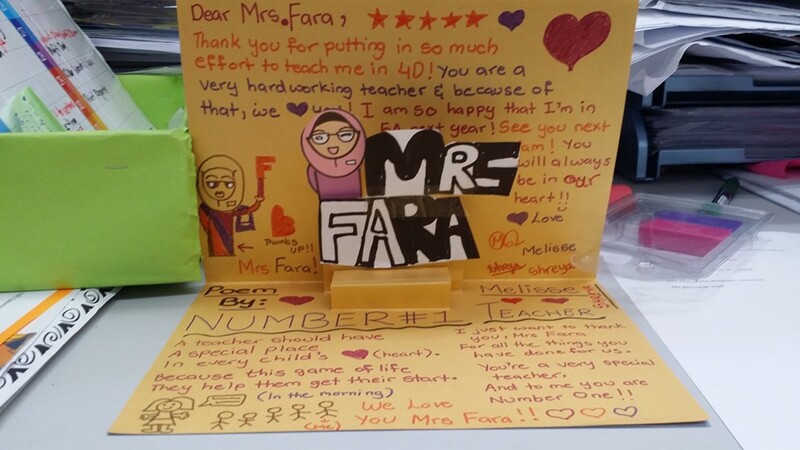 1) You will get an Experienced Qualified Teacher with over 8 years of teaching experience in Mathematics, with relevant background in Math Olympiad and Problem Solving Heuristic skills, who have taught in many primary schools, including RGPS, NYPS, MGS, Nan Hua PS, Henry Park PS, etc. 2) You will get an Expert Curriculum Designer who has years of experience designing lessons, worksheets, workshops and programs related to both the local MOE and the IB International curriculums. This means that your child will benefit from a tutor who can easily identify areas of weaknesses and custom design an effective lesson that meets your child's needs. 3) Our tutor is an assessment book author and editor. She has published two books on Math Olympiad, teaching and inspiring students to learn how to excel at Math Olympiad and Competitions. 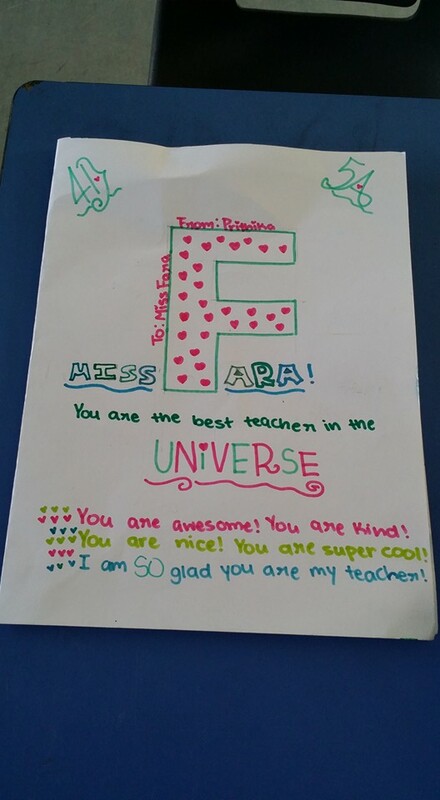 4) Our classes are fun, engaging and effective! We believe that Maths is meant to be fun and the best way to ensure understanding and long-term retention is by encouraging multi-sensory learning. We use flashcards, games, whiteboards, hands-on activities, worksheets and mock papers to ensure a variety of approaches. Our tutor is also extremely patient and explains each concept really well. It's no wonder the students love her! Our exam results improvement record speak for itself. 5) With only a maximum of 6 students per session, our classes are small and focused. This means we believe in quality, not quantity. Your child deserves the highest quality of learning experience and hence should receive full attention and interaction with the tutor. We are so confident, we'll give you the first experience for free. All you have to do is to enter your details below and we will get back to you within the next working day. YES! I am interested to redeem the free trial lesson! It is conveniently located near the new Marine Parade MRT station and within a short 5-7 minutes walk from Parkway Parade Shopping Centre.